One of the joys of travelling back to see family in the UK in the early years after moving to Australia was making one's way to the local pub and ordering a pint of cask conditioned English pale ale. The contrast between its refreshing subtleties and some of the bolder, highly carbonated craft beers that were starting to become popular Down Under was a welcome pleasure. And, after a few weeks when the palate was crying out for something more ballsy, we knew there would be plenty to do the trick once we landed back in Melbourne. These days, with the British craft beer scene flourishing, you can satisfy pretty much any beery desire – from real ale to sour to high octane IPA – within the one British pub. Here, if anything however, the availability of English style ales, let alone those that have been cask conditioned, has gone backwards over the same period. So, even without the celebratory nature of this release, the arrival of an English pale ale is welcome at Crafty Towers. The occasion? 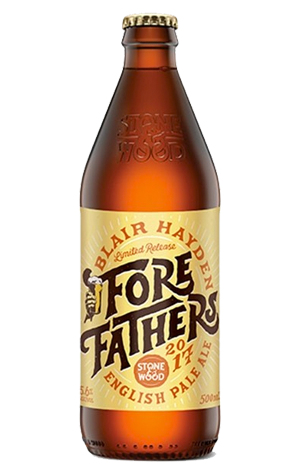 A desire by the Stone & Wood team to recognise the contribution of Blair Hayden to the Australian beer industry. He is the man who launched the Lord Nelson Brewery Hotel more than 30 years ago – read our feature on the milestone here – and has turned it into one of the genuine must-visit beer venues in Australia. The Lord's beer output has been predominately inspired by the ales of the UK that led Blair to take over the old pub in The Rocks in the first place and this beer – the third Forefathers release after those created with Phil Sexton and Willie Simpson – maintains that tradition. While it may be highly carbonated compared to the versions you would get via hand pump in the UK, this English pale ale deals in the sort of subtleties you'd expect from those beers. A combination of Maris Otter malt with English hops and an addition of bergamot tea delivers gentle floral, citrusy and spicy aromas atop soft, biscuity malt flavours. It's just the sort of beer you'd want to devour by the pint at the Lord Nelson – which you can do in the company of the brewers and The Lord himself on August 24 when they head there for the beer's official launch. Watch a video about Blair here.